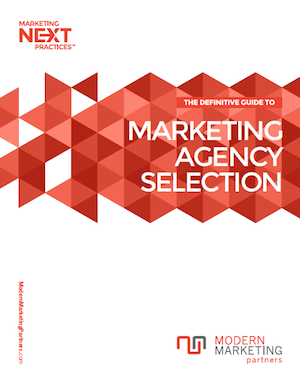 The Modern Marketing Partners agency services brochure is now available! Take a look at all of the projects we’ve worked on as well as the services we offer our clients. Not only does the brochure showcase several examples of marketing programs by Modern Marketing Partners, but it also raises questions to you on what you are doing to keep your marketing efforts up-to-date, efficient and well, modern! Use the comment box below and tell us what you think of the new brochure! If you’re interested in learning more about a particular service, we also offer marketing whitepapers for you to read at your convenience. Whether its marketing measurement, planning, public relations or SEO, a whitepaper is available to you. If you or anyone you know is interested in downloading these informational brochures and whitepapers, be sure to share this post with them through the bookmarking tools below! We encourage you to give us your feedback as well so we can provide you with more whitepapers on marketing topics that are of interest to you!